To have a successful online course, your students need to see results. More specifically, they need to see the results that you promised. But how can you help them get there without working one-on-one with each person? 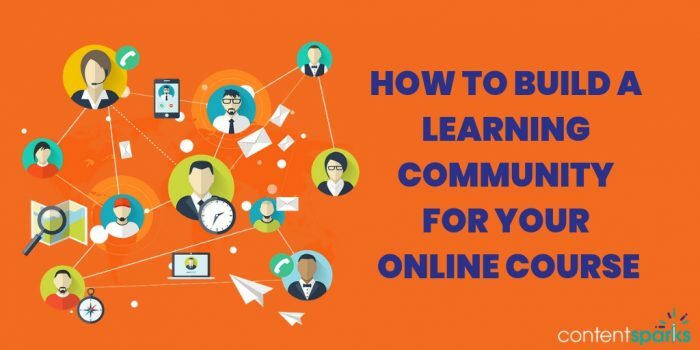 By leveraging the power of a learning community, you can increase your online course success rate exponentially. Completing a course online, especially a self-paced one, can be lonely and isolating. Even if students can contact you personally, that’s not the same as having a group of like-minded people to share experiences and feedback with. You can increase the pricing of your course to reflect the higher value! Don't have an online course yet? Check out our article on How to Create Your Spectacular, Signature Online Course. Ready to add a community for your own online course? How big is your current student audience and what is the potential size? Where are they most likely to interact? For example, are they on Facebook frequently or would they prefer interacting on a separate platform? What budget are you willing to invest, if any? Option 3 – An already existing community feature from your online course hosting platform. While a closed Facebook Group is one of the quickest and most tempting ways to create your online course community, remember that you don’t own that platform. If Facebook decides to close down your group, you will lose all the data. Also, not everyone spends time on Facebook. That said, a Facebook Group can be the easiest place to start your first course community. Once you’ve picked your platform, there are a few key tasks you need to complete before inviting your students to join. These will all help ensure your students understand why they are there, the guidelines for members, and how to get the most value from the community. Goals – Write down the primary goals for your course community and why you created it. Description – Describe your community in a sentence or two, so people know what it’s all about in a snapshot. Benefits – Specify the benefits your students can expect from participating in the community. Guidelines – Lay out the rules for participating in the community and any do’s and don’ts. Include tips for getting the most value from the group too. Use all the above information where relevant on your community home page and when inviting people to join. And don’t forget to include your branding on all your community pages – logo, tag line, values, a picture of you, etc. Have a way to contact you clearly visible too. Once you have your course community platform ready to go live, you need to start adding and onboarding members. Once someone does join your group, you also need to give them a quick orientation. This is their ‘onboarding’ process which will help them get the most from the community. Create a ‘Start Here’ post – with the key information they need for participating, including best practices for asking questions and commenting, most important community rules, links to FAQs, hashtags for key topics, and links to key resources. Create a ‘Welcome’ post – with names of newest members and an invitation for them to introduce themselves. Be Present – You must be present in your community for it to be successful, even if you have other people moderating for you as well. Decide on your role and if you need additional moderators to help. Make sure all tasks are covered – such as answering questions, monitoring comments and dealing with breaches of guidelines. Facilitate and Lead by Example – You will need to lead by example and show your members how to interact and behave. Facilitate your members’ learning by engaging them through your content and other techniques – such as questions, quizzes, polls and affiliates. Plan Your Content – Decide what methods you will use for interaction and plan your content ahead of time. Keep to your schedule so your members can know what to expect. While it can be difficult to generate interaction when you first start your course community, that will change over time if you continue to put in the effort. As the community for your online course grows, you’ll be faced with a few challenges. That includes keeping up the momentum of engagement and interaction that leads to learning, as well as managing the day-to-day running of the community. Which topics generate the most engagement? What questions spark the most comments? What issues illicit the most interaction? Which resources or links get the most traffic? What forms of content create the most excitement? What challenges or questions come up over and over? By answering those questions, you’ll gain insights about both the content that inspires learning for your members AND where you might need to make changes to your online course. Leverage Automation – Plan some of your content in advance and schedule it using a tool like Buffer or Hootsuite. Set Up Alerts – Make sure that you have alerts turned on so that you know whenever someone has commented or posted in the community. Block Your Community Time – Reserve a set amount of time each day to be present in the community. And don’t peek at what’s going on the rest of the time! Hire a Community Manager – If you have the funds, consider hiring someone to help you run the community. They can manage all the admin details and even answer some questions, freeing you up to focus on the most value-added content. Adding a community to your online course may sound like a lot of work, but once you start seeing the benefits, you’ll wish you hadn’t waited to start one. Your students will be happier with their results from your course, and you’ll see more sales as you gather more success stories and improve your course over time. Need help selling your course? Check out our article on How To Create a Course Sales Page That Converts. Want a quick worksheet for creating your course community? Download our Online Course Community Worksheet below. It’s an easy way to make sure you’ve covered all the basics for building an active, engaging learning environment for your course students. Want to learn more or teach others how to build a community? At Content Sparks, we provide course creators with the content you need for quickly creating your own online or offline programs. All you have to do is edit it any way you want, put your name and branding on, and then teach it as your own. You can even sell it for 100% profit! 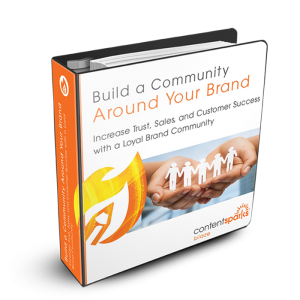 This is a perfect program for anyone who wants to increase audience trust, customer success, and sales – by building a loyal, engaged community. Check it out now and let us know if you have questions ?